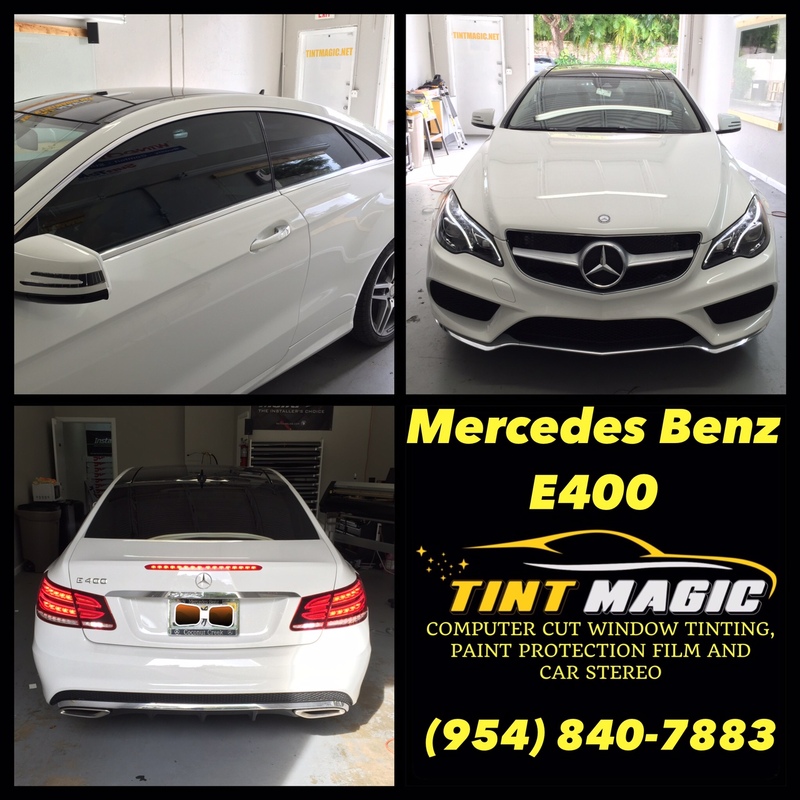 Mercedes Benz E400 Coupe at Tint Magic Window Tinting Coral Springs. Call us for a free estimate! (954) 840-7883. This is a lovely, sothing, deliberately unsensational sort of car, sporting a mix of C and E-Class architecture underneath. Mercs are slow burners at the best of times – unless there’s an AMG badge around – but this is a seriously smooth operator. Engine-wise, the E-Class Coupe is available with Merc’s familiar 2.1-litre diesel in two states of tune, as a four-cylinder petrol and two six-cylinder engines; a 3.5-litre diesel and a twin-turbo 3.3 litre petrol V6. The big diesel suits the car well. It’s silent but for a bit of wind rush around the A-pillars and door mirrors, with the engine note relegated to a distant thrum. As a motorway tool, it’s incomparable. It probably won’t surprise you to learn that the petrol V6 is the one to have if it’s excitement you’re after but in truth, nobody really needs anything more powerful than the CDI. he E Coupe is actually based on the C-Class meaning it’s shorter than the saloon and so rear leg room is adequate at best for adults. And despite front seats that tilt and slide, getting in and out can be on the inelegant side too. The boot is capacious at 450 litres, but quite shallow. The interior follows the same sensible layout of the E-Class saloon but it’s not an identical copy. It’s been constructed with a confidence that’s been missing from recent Mercs, as if each piece hasn’t been built by the lowest bidder. So it’s strong, solid, purposeful with all the materials feeling cm and not mm thick.